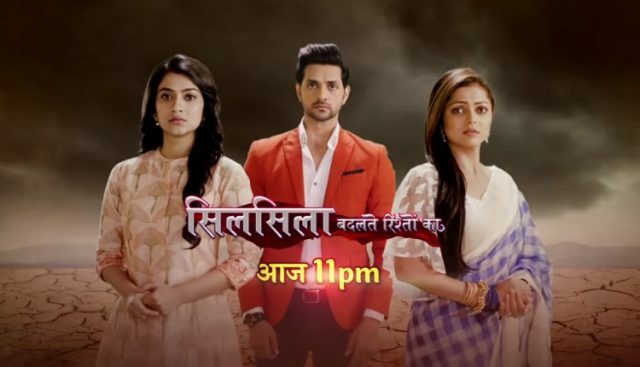 In the latest update of Silsila Badalte Rishton Ka 15th November 2018, there is Mauli vows to never let Kunal learn that Mishti is his daughter. The written update of the serial begins with Ishaan tolding to Mauli that he will make some excuse and can cancel the dinner plan. The dinner plan is made by Mauli and she also invites to Kunal for it. Mauli stops to Ishaan and tolds that Kunal’s presence does not matter to her as he is her past now. And now she does not have any problem with this. She said to Ishaan that she never want to learn her past. He just hates for her past. Kunal overhears their conversation and he asks Pari that to go home, but she refuses to leave. They both were forced to Kunal to have the dinner with them. Mauli said to her that she does not break her promise and they will go for dinner. At the restaurant, Ishaan suggests that they will order the food of kids choice only. They ask to Pari and Mishti for pani puri. And Kunal and Mauli recall the past memories that how Kunal and Nandini both have competed with each other when they ate the pani puri. Mauli shows to Kunal the extra care towards Ishaan and Kunal is relieved by seeing she is happy in her life. Mauli talks to herself and said that she has realized that she can live without Kunal. And now she is fully independent of others. There at home, Mamma is too worried about Mauli. Dida tries to make her understand that Ishaan will be taken care of all the things. At the dinner table, Ishaan asks Kunal about his lifestyle, job. While talking Pari said to him that she looks exactly like her mom. This makes Mauli soo angry and she drops that water on Ishaan ’s clothes. Precap: At home, Mauli tolds to Mamma and Dida that she is very happy about Kunal. His daughter has the love of both the parents, and they are living happily. She is also ready to marry with Ishaan now.